African-Americans, bigotry, black leaders, California, CBC, Congressional Black Caucus, Democratic Party, double standards, Elijah Cummings, exclusionary policy, G. K. Butterfield, G. K. Butterfield is actually black!, Harold Ford, hypocrisy, Missouri, No Whites Allowed!, North Carolina, Pete Stark, playing the race card, preferential treatment, race-based admission, racial favoritism, racism, Republican Party, reverse racism, Stephen I Cohen, William Lacy Clay Jr., William Lacy Clay Sr. Promoting Equality And Unity Through Race-Based Exclusion. Americans take pride in the notion that their nation is a meritocracy, a place where the pathway to success remains open to every man, woman and child regardless of his or her race. This has not always been the case: for almost two-hundred years the United States denied equal rights to all its citizens based on the color of their skin. But times have changed, and most 21st Century Americans regard as odious any organization which precludes membership based on race. This is particularly true with regard to government. Meet the Congressional Black Caucus. African-American members of the House of Representatives founded the CBC in 1971 to address inequities within the African-American community, particularly in regard to poverty, economic security, voting rights and health. Because the Caucus concerns itself exclusively with issues of importance to black Americans, critics of the Caucus or of Caucus members often find themselves cast as racists. The Caucus’ virtual immunity from criticism has until very recently permitted a remarkable lack of press scrutiny. She Likely Takes A Dim View Of Race-Exclusive Organizations. Although their membership has been primarily composed of Democrats (there have been a handful of black Republicans in congress over the years), the Congressional Black Caucus is not officially affiliated with any party. Other than being a congressperson, the one qualification for membership in the CBC is being black. Despite this non-partisan stance, it might be expected that with the Caucus being almost exclusively comprised by Democrats, Caucus members’ loyalty might be divided between race and party. Not so. On numerous occasions the CBC has supported primary challengers against sitting Democrats if the challenger was African-American and the sitting Democrat was not. Pete Stark, a California Democrat and white person, tried to join the CBC in 1975. Although the Caucus’ rules do not specifically prohibit white people from joining, Stark was politely rebuffed. The CBC Is Keeping It Real, And By Real We Mean Exclusively African-American. More recently, another white guy tried to join the club–Tennessee Democrat Stephen I. Cohen. 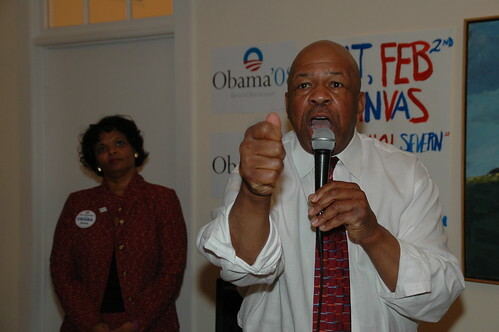 While campaigning in the heavily black district formerly held by Harold Ford, Cohen promised that if elected, he would join the Caucus to better represent the interests of his constituents. Cohen failed to understand that the CBC’s interest lie with black politicians, not black constituents. Shortly after Cohen won the seat, the Caucus made it clear that even one caucasian was one too many. Undercover Brother: The Rep. From NC Is A Proud Member Of The Caucus. Unfortunately, the delicious irony of race-based exclusion by a congressional body stemming directly from the civil rights movement seems lost on the members of the Caucus.